If you drink a lot of craft beer, you’ve undoubtedly encountered the following dilemma: Either you wind up with more empty bottles than you can possibly fit in your recycle bin each week, or you get your brew by the growler and inevitably have it go flat before you finish it all. The only other options are to downsize the amount you drink (not likely) or fully commit to your craft beer habit and buy yourself a kegerator. Neither option is particularly enticing, but thankfully somebody has cooked up an alternative solution. 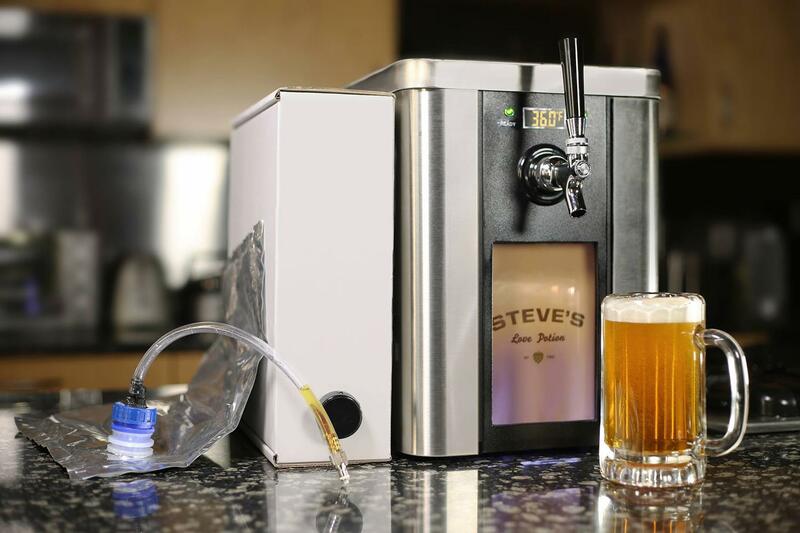 Freshly launched on Kickstarter late last week, the Synek craft brew dispenser is an upcoming device that bills itself as the “Keurig of beer.” But don’t let that title fool you — it doesn’t use some kind of awful powdered beer to make you single-serving pints when you’re in a hurry. Truth be told, aside from the convenience aspect, this thing is nothing like a Keurig machine. Think of it more like tiny kegerator you can keep on your kitchen counter. Inside its temperature-controlled hull, the Synek is equipped with a removable one-gallon vacuum pouch that you can fill up with the beer of your choosing. This solves a number of different problems. First and foremost, it cuts down the price you pay for beer. Bottled beer typically comes with a bit of a markup to cover the cost of factory bottling, so if you buy it in bulk from a fill station, you save a bit of money. The only downside is that when you fill up a growler, you’ve typically got to drink it all in a couple days time or it’ll go flat. Synek solves that problem too. The device’s special tap system is designed to fill the pouch without letting in any air, so in addition to holding a larger volume than your average growler, it also keeps the beer from losing carbonation or going bad over time. And to top it all off, Synek’s adapter fits into practically any kind of tap, so you can fill up just about anywhere — be it your buddy’s backyard brew lab, or your local craft brewery. The project is already well on its way to meeting its $250,000 funding goal, and if you back it right now during the early stages, you can lock down a Synek system for just $299.